Miss Parichad is a Program Officer at AIT Extension. As Program officer, she assists in coordinating and organizing training courses and study visits, and in preparing training materials. She is also in charge of photo and video documentation of AIT Extension training programs. Ms. Parichad joined AIT in 1988 as a Clerk/Typist, and was promoted to Secretary in 1992. 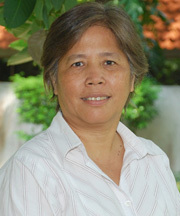 She started working as Program Assistant in 1994. Ms. Parichad received her B.Ed. degree in Audio Visual Education from Ramkhamhaeng Open University in 1986.